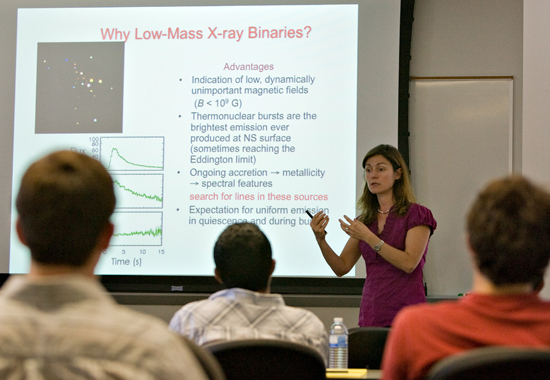 The Department of Astronomy has a large and complex academic program. It includes (1) a highly-ranked Ph.D. program in Astronomy and Astrophysics, where more than two thirds of the graduates go on to long term or permanent employment in astronomy, (2) one of the nation's largest undergraduate majors programs, where most students work directly with faculty on research, (3) both a technical astronomy minor and a non-technical minor for Liberal Arts majors, and (4) one of the nation's largest enrollments in astronomy for non-science majors, supported by in-house research on effective, learner-centered pedagogy. The links at the right provide information to assist both potential and current students regarding the undergraduate and graduate programs offered.